New York-based vitamin manufacturer recognized for its financial growth, best-in-class customer service and continuous support of nationally recognized charitable organizations. Over the past 12 months, we have developed and implemented a variety of initiatives designed to make our client’s lives simpler and easier while further improving our bottom line. Nutricap Labs, an award-winning provider of turnkey vitamin manufacturing, graphic design, packaging and order fulfillment services, announced today that it has won the 2013 Best in Biz Silver Award for Company of the Year – 1 to 99 Employees. 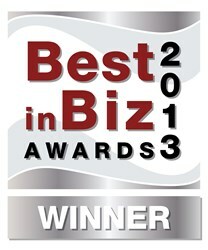 This marks the tenth time that Nutricap Labs has won a Best in Biz Award since 2011. Capitalizing on the opportunities lost by other vitamin manufacturers that failed to comply with Good Manufacturing Practices mandated by the Food and Drug Administration, Nutricap Labs was recognized by the business awards program for its financial growth, best-in-class customer service and continuous support of both local and national charitable organizations. Specifically, the Company increased its annual revenue from $28 million in 2011 to $30 million in 2012, successfully modified its pricing and inventory management system to provide their customers with industry-leading quote and product completion times, and donated funds to Habitat for Humanity, Crohn’s and Colitis Foundation, Island Harvest and Vitamin Angels. According to its website, Best in Biz Awards honors companies, teams, executives and products for their business success as the only independent business awards program judged by members of the press and industry analysts. Any company from any industry based in or operating in the United States or Canada is eligible to enter any of the more than 50 award categories. For more information about Nutricap Labs, visit our website or call (800) 494-6154 to speak with a Product Advisor. Established in 2005, Nutricap Labs is an industry-leading provider of turnkey vitamin manufacturing, graphic design, packaging, and order fulfillment services. Our company is a five-time Inc. 500 | 5000 honoree and has received a multitude of accolades over the years from leading business and entrepreneurial advocates such as The American Business Awards, Best in Biz, and The Golden Bridge Awards. For more information about our services, please visit our website or call (800) 494-6154 to speak with one of our friendly and knowledgeable Product Advisors.